The red symbols indicate a serious malfunction, whereas the yellow ones represent other malfunctions or items requiring attention. Additional messages to assist the driver may be shown with the red or yellow symbols. Shift to P, otherwise vehicle can roll away. Doors do not lock if lever is not in P.
The message will disappear from the display after about 5 seconds. If required, the message can be called up again by briefly pressing the button SET, fig. 24. A red symbol warns of a serious malfunction. – Check the function displayed. Obtain professional assistance if necessary. The red symbols indicate a Priority 1 fault (serious malfunction). Should a Priority 1 fault occur, a red warning symbol will appear at the top of the display ⇒ fig. 25. The symbol is accompanied by a driver message giving you more information about the fault. This symbol is accompanied by three warning chimes. The symbol will keep flashing until the fault is corrected. If several Priority 1 faults are detected at the same time, the symbols are displayed one after the other for about 2 seconds at a time. This message will disappear after about 5 seconds, but you can call it up again at any time by pressing the SET button. If the symbol flashes in the instrument cluster display, there is an alternator fault or a fault in the vehicle's electrical system. In addition, a message will appear. This message will disappear after about 5 seconds, but you can call it up again at any time by pressing the button. If the coolant warning lamp in the instrument display lights up as well as the alternator warning lamp while driving ⇒ page 33, stop the vehicle immediately and switch off the engine. In this case the coolant pump is no longer being driven, and there is a risk of engine damage. 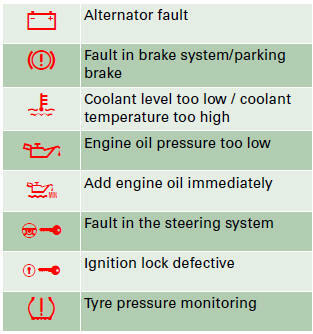 A fault in the brake system should be corrected as soon as possible. – Check the brake fluid level. – Drive carefully to the nearest qualified workshop and have the fault rectified ⇒ . – If the symbol appears after you switch on the ignition when the vehicle is stationary, please check whether you can release the parking brake. If this is possible, you should drive without delay to the nearest qualified workshop and have the fault rectified. If the parking brake cannot be released you should obtain professional assistance. – If this symbol should appear while driving, there may be a malfunction in the drive-away assist or the emergency brake functions. You may not be able to apply the parking brake. It is also possible that you cannot release the parking brake after it has been applied. Drive the vehicle to a qualified workshop and have the fault repaired. If the ABS fails, the ABS warning lamp will light up together with the brake warning symbol ⇒ . • If the brake fluid level in the reservoir is too low, this could result in an accident. Do not drive on. You should obtain professional assistance. 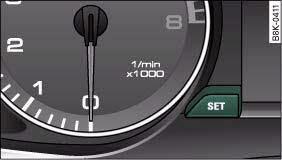 The warning lamp in the instrument cluster will start flashing as well if there is a fault in the brake system. • The engine compartment of any motor vehicle is a dangerous place. Before carrying out any work in the engine compartment, switch off the engine and allow it to cool down. Please observe the important safety warningsgggggg 255, “Working on components in the engine compartment”. If the engine oil pressure is too low the fault must be rectified immediately. If the engine oil level is too low, add more oil. If the symbol flashes and the engine oil level is correct, obtain professional assistance. Do not drive on. Do not continue to run the engine, not even at idle speed. The oil pressure warning lamp is not an indicator for the oil level. The oil level should therefore be checked regularly. If the symbol lights up, you must add oil immediately. – Do not have the vehicle towed away. If the vehicle is equipped with the advanced key* feature, you should not switch off the engine with the Stop/Start button because it cannot be started again after the ignition has been switched off. Yellow symbols are accompanied by one warning chime. 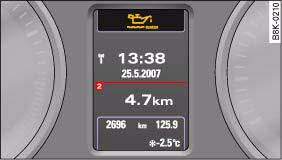 The symbol is accompanied by a driver message giving you more information about the fault. This message will disappear after about 5 seconds, but you can call it up again at any time by pressing the SET button. On some models the speed limit warning 1 and speed limit warning 2 will also be displayed as yellow symbols. These always appear as a small symbol at the top of the display. This message and the symbol will appear if a fault develops in the system while the vehicle is moving. You can continue driving carefully at reduced speed to the next qualified workshop, however the steering may feel heavier and its response may be more sensitive than usual. In addition, it is possible that the steering wheel will be off centre when driving in a straight line. If this message appears and the warning lamp flashes in the instrument cluster, this indicates that the dynamic steering is being initialised. The steering wheel will move slightly after the engine is started. The dynamic steering may be initialised if the steering wheel was moved while the vehicle was stopped. The warning lamp will go out when the initialisation has been completed. The stabilisation functions of the dynamic steering are not available in the event of a system malfunction. If the symbol appears, this means that the light sensor / rain sensor is not functioning.For safety reasons, the dipped beam headlights will then be switched on permanently when the light switch is set to the AUTO position. However, you can still switch the lights on and off in the normal way with the light switch. If the rain sensor is defective, the functions operated via the windscreen wiper lever will still be available. You should have the light sensor / rain sensor checked by a qualified workshop as soon as possible. If the i symbol lights up, have the front brake pads (and, for safety's sake the rear pads as well) inspected by a qualified workshop. The bulb monitor checks whether the lights on the vehicle are working. The bulb monitor checks whether the lights on the vehicle are working. 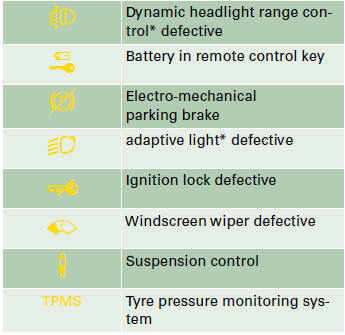 If it detects a defective bulb on the vehicle it will show a yellow warning symbol together with a message indicating which light is not working. If the symbol lights up, this means that one of the turn signals (front or rear), headlights, brake lights, rear lights, fog lights or the rear fog light is not working. • Bulbs are sensitive to pressure. The glass can break when you touch the bulb, causing injury. • Incorrect handling of the high-voltage element of xenon gasdischarge bulbs* can have potentially fatal consequences. Have the components repaired or replaced by a qualified workshop. If the symbol lights up, top up the fluid for the windscreen washer and headlight washer system*. When this symbol comes on for the first time, there are about 8 litres of fuel left in the tank. You should fill up as soon as possible. 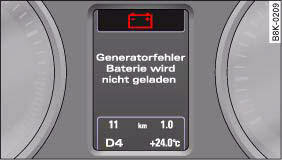 If battery power drops to a level at which you may encounter problems when starting the engine, the display will show the symbol and the driver message Low battery charge: Battery will be charged while driving. Please bear in mind that the starting ability of the engine may be impaired while this message is shown. If the message appears in the display after the ignition is switched on or while driving, and goes out again after a period of time, the battery has been charged up again sufficiently while the vehicle was being driven. If the message appears in the display after the ignition is switched on or while driving, and does not go out again, the battery is not being maintained at the proper power level. Starting reliability may be impaired. You should have the battery checked by a qualified workshop as soon as possible. Add oil, max. 1L. You may continue driving. If the symbol lights up in conjunction with this driver message, add not more than 1 litre of oil at the next opportunity ⇒ page 259. If the symbol lights up in conjunction with this driver message, please check the engine oil level as soon as possible ⇒ page 258. Top up the oil at the next opportunity. 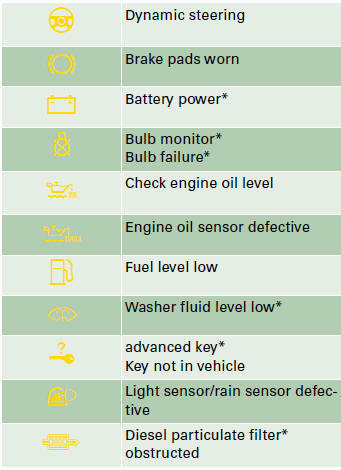 If the symbol lights up, take the vehicle to a qualified workshop and have the oil level sensor checked. Until then it is advisable to check the oil level every time you fill up with fuel. When the symbol lights up you can assist the self-cleaning function of the filter by driving accordingly. You should drive at a speed of at least 60 km/h (engine speed about 2,000 rpm) for about 15 minutes in 4th or 5th gear, or with the selector lever in position S on vehicles with automatic gearbox*. As a result of the increase in temperature the soot in the filter will be burned off. The symbol will disappear once the cleaning process has been completed successfully. For further information on the diesel particulate filter. This symbol indicates a malfunction in the dynamic headlight range control. Take the vehicle to a qualified workshop to have the dynamic headlight range control function repaired. This symbol indicates that the adaptive light is defective. Take the vehicle to a qualified workshop to have the headlights and/or the control unit for the adaptive light repaired. If the symbol lights up in the display, there is a malfunction in the electronic ignition lock. Take the vehicle to a qualified workshop to have the problem remedied. This warning lamp monitors the damping effect of the shock absorbers. If the symbol lights up in the display, there is a malfunction in the vehicle suspension. Take the vehicle to a qualified workshop to have the problem remedied. This symbol indicates a malfunction in the electronics for the windscreen wipers. Take the vehicle to a qualified workshop to have the windscreen wiper system repaired.